The Shields Ferry will host busking music festivals during its Tyne crossings this Bank Holiday weekend. Known as "The Greatest" he used to float like a butterfly and sting like a bee. 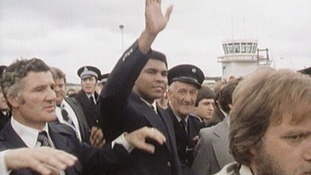 This weekend saw the 40 years since his visit to Tyneside. Harry was world rowing champion who drew thousands to the banks of the River Tyne in the 1850s. A Tyneside man has been questioned on suspicion of the murder of notorious criminal John "Goldfinger" Palmer. The A69 is blocked both ways at Northumberland and there queueing traffic between the B6319 (Haydon Bridge) and Ridley Hall Road (Bardon Mill). This is affecting the route between Newcastle and Brampton. Police are dealing with an incident on the A1 southbound sliproad with the A19 at Seaton Burn Roundabout in Seaton Burn, north of Newcastle. It's thought there was a collision between two vehicles that happened around 3.30pm on Sunday. One man has been injured although the extent of injuries his are not yet known. The sliproad is currently closed and is expected to be closed for some time while enquiries are carried out into the collision. A Northumbria Police spokesman said they were keen to trace a black Citreon C2 car which was in the area at the time. The boy fell 20 feet off a cliff in Cullercoats and suffered serious head and leg injuries. A man climbed an electricity pylon, cutting off the power supply to thousands of North Tyneside homes. A new set of stamps is being published to mark the events of the the First World War - including the important role civilians played. The six stamps mark the Battle of the Somme and the Battle of Jutland, while munitions worker Charlotte Meade is pictured in her overalls. At least 120 men from the North East perished during the Battle of the Jutland, including the three Malcolm brothers from Stockton-on-Tees. Charles Malcolm, aged 22, John Robert Malcolm, aged 25, and Joseph Malcolm, aged 29, all died onboard the HMS Queen Mary when it was destroyed. "The Battle of the Somme and Jutland commemorations are important milestones in the First World War centenary and I hope that these stamps encourage people to remember and learn more about the pivotal events of 1916." Philip Parker, of Royal Mail, said: "A century ago our armed forces were making the ultimate sacrifice on land and at sea, and non-combatants were making an extraordinary contribution overseas and on the home front. Our stamp issue pays tribute to all." The stamps are the third set of a five-year commemorative programme.